Our client provides affordable rental accommodation. This project was the fourth affordable housing project undertaken by this practice. Upon completion, 42 out dated flats had been replaced by 63 new single bedroom outcomes and over $10m expended using a combination of client, State Government and National Rental Affordability Scheme funding. This project involved replacing seven single storey pensioner flats on a corner site and increasing to twelve. The replacement development consists of new single bedroom dwellings in three domestic scale buildings, separated by common landscaped areas and a car park. The major challenge was that chemical contamination of mainly soil vapour was found in the surrounding area and our client sought to redevelop the site in a safe manner. LBW Environment provided advice including onsite testing. It was established the soil vapour impacts were located near the street boundaries and therefore the dwellings were sited to maximise separation from the street. Our client and LBW Environment consulted with the Environmental Protection Authority (EPA). A specialist contractor liaised with Flightpath, contractor and structural engineer to ensure that all subfloor areas were suitably sealed and ventilated to avoid soil vapour migration into buildings. The sealed vapour management system was placed on the ground below the slabs and ventilated to the atmosphere above each dwelling. Similar to previous projects for James Brown, each of the three buildings was designed to the modest scale of a detached dwelling within a front garden setting in context with the surrounding suburban detached dwelling context. With cost and locality in mind, the external appearance included a simple repeated hipped roof form. Interiors are simple and robust. Each of the three residential flat buildings has a slightly different colour palette. For the project specialist advice and design input was sought from LBW, CETCO, structural and civil engineer, landscape architect, services engineer and cost consultant. The estimated Construction Cost of $1.8m excluding GST was exceeded due to time constraints, procurement and site management. The very tight NRAS project timeline was met, through a direct negotiation with a responsive managing contractor. The buildings are constructed in reverse block work veneer on polished concrete slabs, which provides high levels of comfort and lower energy consumption. 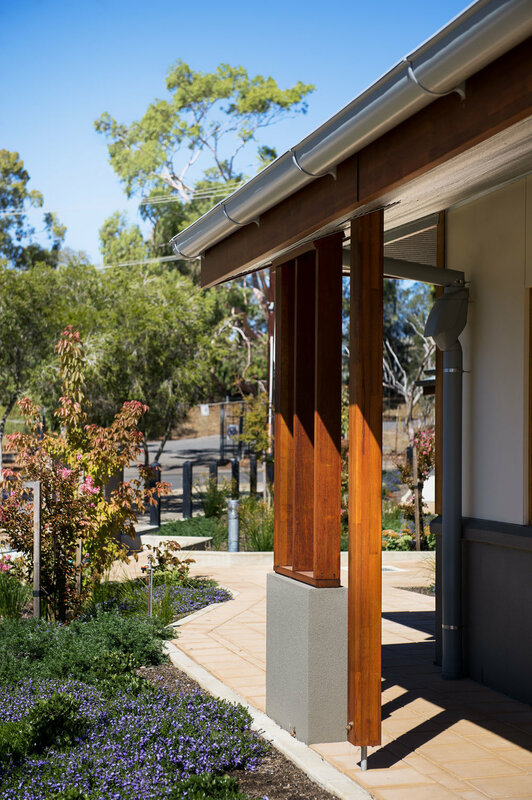 Generous verandah areas with drought tolerant landscaping and stormwater detention, good cross ventilation, rainwater harvesting and solar hot water initiatives were adopted. While the basic single bedroom module had been previously tested and fine-tuned over four projects the different challenge for the project was one of providing a safe residential development that responded to its suburban context, but importantly integrated successfully an accepted, best practice, soil vapour mitigation system. From a client and end user perspective the single bedroom module, which provides tenants with accessible private space, views, natural light and the opportunity for some social interaction and streetscape engagement, has had positive benefits in the reported improved behaviours of tenants.